Multiply Your Market Value and Income a Hundredfold. Establish or Expand a Luxury Homes Division. At the "Top" or High-End of the Market. that Underscores this Program (the Best Place to Start). The Wealth Agenda / Listing is Job One. Selling follows listing and team-building to accomplish both altogether are a broker's -- Wealth Agenda -- the potential of which is multiplied many times over when listing and selling at the Top of the market. Join with Broker/Mentor Al Lewis / In an affiliation for listing and selling properties ranging in price from $1/Million to $10/Million or more within areas and regions you would like to work whether you have ever done business there before or not, or are located nearby or not. Upon affiliation, be in the market in seven-days' time with an all new high-end listing program and gain new listings within thirty-days by duplicating, with Al Lewis as your guide both in-field and in-house if in southern California, his highly successful program for listing and selling luxury homes seasoned over a time spanning five-decades within virtually every top community of the nation’s most competitive market. The Five-for-Fifty Plan / As a broker/manager or team leader grow an inventory of custom homes, estates and resort-oriented residences without having to (1) Go through a lengthy learning curve building a Luxury Homes Division to do this or having to (2) Invest large sums of cash establishing an institutional image to gain access to some small market in head-to-head competition with Big Fish in a Small Pond agents and companies already established there or having to (3) Proselyte a team of experienced agents to get to where you want to go or (4) Having to waste years of time in trial and error and spending (5) A fortune's worth of hard earned money figuring out how to cost-effectively market high-end real estate both locally and to buyers in the International community. Instead, empower yourself for listing and selling at the Top of the market now by partnering (in name only) with "Al" under a unique "Affiliate" agreement if in southern California or "License" agreement if in another region or state and, as a Wealth Agenda participant put five agents to work doing this under one agreement for the price of one, figuratively speaking, for there is no actual cost to participate except a nominal start-up fee that is refunded on the first transaction. In partnership we, together, will seek to have each of the five gain ten or more Top of The Mark listings within any local or area within five months of start. Think of this as the Five-for-Fifty Plan. Once you and your team begin to list and sell at the "Top" of the market with power and authority, neither you nor they will even remember former limitations. The Path to Success / If you want to catch big fish, you've got to fish in deep waters. To experience a large measure of life, you must leave behind the safety of shallow water and launch out into deep blue. The fastest and safest way to do this in sales is by walking-the-walk and talking-the-talk of someone already doing it: an in-field, in-house, hands-on, long successful listing partner with a "Knockdown" program for turning slow-sale real estate into fast-sale real estate; just the thing a high-end seller that has experienced an expired listing and a builder with a dead-in-the-water project wants. What better way to get to where you want to go in real estate quickly with ease? 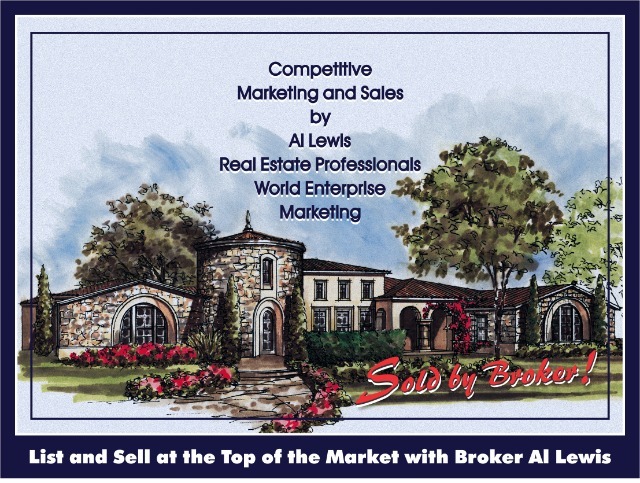 Join with broker/mentor Al Lewis for listing and selling at the "Top" of the market today. (1) Visit the orientation website appropriate to your locale. TheRealEstateFellowship.com / If located within the southern California area. TheTopJobinRealEstate.com / If located within another region or state. (2) Contact Al Lewis direct to request a program introduction and start-up pro forma titled: The Power of One: The Top Job in Real Estate. Please advise of the state, region, and locale of your place of business to receive a program introduction specific to your area. Send request to / AlLewisMarketing@gmail.com. The Wealth Agenda is not business plan. A business plan is a formal statement of a set of business goals, the reasons they are believed attainable, and an outline for reaching those goals within a specific time frame like one, two or three years. When owners or managers of an existing business seek to undergo a major change, a business plan is often required because partners, banks and investors will look for a return-on-investment within some specified time. A business plan is all about the future and not the present. If we want to experience growth now, we have to be thinking about now and not the future; but plans lead to the future you want to experience, I know, is the comeback. Why would you negate a good plan, the planning process or a person making plans, you might think or ask? Here’s Why / A good, well thought-out business plan is the root cause of procrastination. I, for example, have a self-justifying ego and think I am smart. When I make the effort to create a well thought-out business plan I know the finished product is the full culmination of my wit and intelligence. I then conceive a timetable (future plan) for its implementation: next week, this year, over the next three years, etc. When the time comes to begin, I pull the plan out, look it over and realize that I am smarter now then I was then (at the time I made the plan) and that some parts of the plan must now be rethought, rewritten, re-planned and rescheduled. After doing that, I conceive a timetable (future plan) for its implementation: next week, this year, over the next three years as said and organize for beginning again. When the time comes to begin, I pull the plan out, look it over and, well, you know, I go through the whole process again. This sometimes goes on until the excitement over some idea that motivated me to write a plan, in the first place, has just faded and gone away. We've all done this, haven't we! An agenda, on the other hand, is all about now. An agenda is a list of activities in the order in which they are to be taken up and completed within a specific time frame of short duration: today or tomorrow; before noon, for example; or from 2:00 pm to 5:00 pm, etc. It is a list or outline of things to be done and may also be called a docket. An agenda, which is basically just a To Do List, sidetracks the ego and its desire to reflect, plan and project by its present moment, task oriented requirement of completion. The Wealth Agenda is all about now, about teaming with or working with me for listing and sales success at the "Top" or high-end of the market now, and not about working on a plan for doing it sometime future. If establishing or expanding a Luxury Homes Division or just selling at the "Top" or high-end of the market has been on your mind for a while, the Wealth Agenda is a shortcut to getting there, for doing it without having to go through a long, costly learning curve and start-up period to find success. Success, it has been said, is found on the far side of failure. In partnership with me for listing and selling at the "Top" or high-end of the market, you, your associates, colleagues and team members will bypass that curve completely. !!! Listing is Job One !!! Introductory Pro Forma / Please respond by email to request and receive a program introduction, job description and start-up pro forma titled: The Power of One: The Top Job in Real Estate. This can be shared with your staff in general for the purpose of recruiting the select-five and others into this program. This detailed article will define for you and your staff exactly (1) How to break-into and sustain listing and sales success at the "Top" or high-end of the market under the umbrella of The Real Estate Fellowship and/or The Top Job in Real Estate (2) It will help you determine your fit (3) It will define for you why it is recession-proof, free of competition and Top of The Mark. We can never outgrow the limits we place on ourselves; we can only set new limits within which we must live. Poet Maya Angelou wrote, "If one is lucky, a solitary fantasy can totally transform one million realities." Just think of it. To Rise Above the Crowd, You Have to Rise Above the Crowd. The Market is Always Good for Those at The Top. Lead the Field. Dominate the Market. Al Lewis -- Marketing Professional Since 1975 -- is the Principal of Real Estate Professionals World Enterprise Marketing, an independent, standalone advertising agency serving the needs of real estate oriented sales professionals, owners and sellers throughout home state, California, the US, and numerous International markets; and Broker of Real Estate Professionals Allstate Marketing, a real estate company licensed with the California Dept. of Real Estate, License No. 00524259. Both are headquartered in Orange County.